Growers (master growers, operations managers, owners) work hard to optimize their facility. Hours are spent finding the right building contractors, sifting through the pandemonium of growing products, and bringing together a harmonious team of people to carry out the job. However, hiccups are bound to occur because indoor growing environments are a complex network of interacting physical and biological systems1! As a result, there is unpredictability in the climate patterns and interconnections within a grow room1. Unfortunately, irregularities in climate patterns are also correlated with yield irregularities2. In other words, if the environmental conditions are inconsistent, then your yields are likely to be inconsistent too! Our mission as master growers is to anticipate and prevent problems in the facility before they escalate. The above mentioned irregularities in climate conditions are also known as anomalies. Anomalies include any sort of deviation from the common trend (Figure 1). They can include both extreme conditions (for example, especially hot or cold temperatures in the grow room) or unusual conditions (such as an entire day in the grow room that is 0.5°C warmer than the day before). Climate anomalies can be detected by all of Braingrid’s Sentrollers. This is a powerful tool for growers because it puts intelligence into their hands and draws their attention to harmful conditions that reduce yields, delay harvests, and ultimately reduce profits. Braingrid Sentrollers are installed in cannabis facilities across the country and so we have an inside look at the challenges haunting most cannabis cultivators. For the purpose of this article, we will focus on anomaly data detected using Braingrid’s Air Sense, which includes three key sensors: temperature, humidity, and CO2 concentration. Figure 1: Anomalies detected in temperature data from Braingrid’s Air Sense. Anomalies (both subtle and extreme) are shown as green dots. They can happen in any room in a cannabis facility. Some facilities and rooms have more variable conditions (due to variability in room size and shape, facility layout, and type of equipment) and this leads them to also have more anomalies. A number of factors can impact the number of anomalies detected by a Sentroller. One of these factors is location: the placement of a Sentroller (or any sensor, for that matter) impacts the quality of data it can collect. Sentrollers placed in high-traffic areas, such as near walkways, doors, and other entry points, can be subjected to more anomalies. Sentrollers located near cultivation equipment can also be more sensitive; This includes HVAC intake and exhaust points, lighting technology, irrigation, and CO2 injection systems. Ideally, Sentrollers should be placed as close as possible to plants. This allows them to collect the most relevant data possible while also buffering them from human movement. 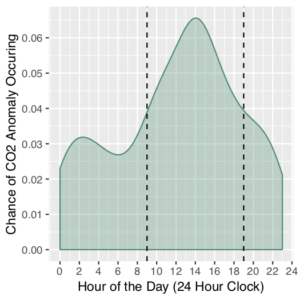 They can happen at any time; however, they are more likely to occur at certain times of the day or particular days of the week (Figure 2). In most facilities, temperature anomalies occur between 6-7 am when the lights are starting to turn on. This suggests that in most facilities, the lights are generating high heat that the HVAC system cannot offset. Along similar lines, most CO2 anomalies occurred mid-day when photosynthesis rates are highest (Figure 2)3. We also noticed that anomalies often correlate with events happening in the facility, such as moving plants around, irrigating, cleaning, spraying, etc. Figure 2: Likelihood of temperature (left) and CO2 (right) anomalies occurring. The dotted lines indicate the interval where most anomalies are occurring. 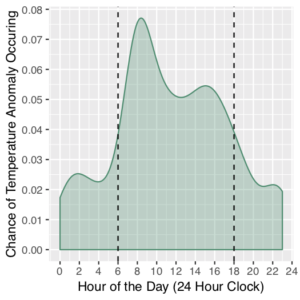 Most temperature anomalies occur when the HPS lamps turn on first thing in the morning. Most CO2 anomalies occur mid-day when photosynthesis rate is highest. Although the location of a Sentroller and the timing of activities near the Sentroller can both generate anomalies, they can also happen as a result of other events. Our data indicates that many anomalies can be predicted ahead of time. Specific patterns in temperature, humidity, and CO2 data can be used to determine if an anomaly is likely to happen in the future or not. For example, let’s imagine that a humidity anomaly occurs: the humidity spikes up to 65%. Under most circumstances, this humidity level is not something to be concerned about and might be ignored. However, Braingrid’s machine learning models are able to look at this humidity spike (and the events in the following hours) to predict (with high accuracy) whether a severe anomaly will occur later. It does this by looking at patterns in the data after the humidity spike. This technology greatly increases the efficiency of master growers by helping them decide which events (such as a humidity spike) need to be responded to and which can be safely ignored. Master growers do not always have time to respond to every minor change in environmental conditions. Braingrid’s machine learning models therefore help growers prioritize problems in their grow room. Growers work hard to optimize their facility by choosing the right layout, equipment, and people. Despite all this planning, there will always be some level of uncertainty – cultivation facilities have complex climate patterns that have very real consequences for plant health! One way to mitigate inconsistent climate patterns in your grow room is to be aware of anomalies and respond to them accordingly. We’ve outlined the basics of anomalies above, but if you’re interested in a more in-depth look, you can download the full white paper here. 1. Young & Lees. Simplicity out of complexity in glasshouse climate modelling. Acta Hortic. 15–28 (1996). 2. Lobell & Asner. Climate and Management Contributions to Recent Trends in U.S. Agricultural Yields. Science 299, 94305 (2003). 3. Ritchie, R. J. Photosynthesis in the Blue Water Lily (Nymphaea caerulea Saligny) Using Pulse Amplitude Modulation Fluorometry. Int. J. Plant Sci. 173, 124–136 (2012).